My cowboy husband always tells me about how his Mom made her own biscuits. He calls them Cat Head biscuits. I just call them good! In a large bowl combine flour, sugar, baking powder, and salt. Mix well. Gradually add the bacon drippings. Make a hole in the center of the dough mix and pour the Sour Dough Starter in it. Mix well. On a floured surface, knead the dough until smooth. lay out the dough using a floured rolling pin to 1/2 inch thickness. Using a glass or biscuit cutter, cut out the biscuits. We usually get 5 good size biscuits. On a rimmed greased baking sheet, place all of the biscuits. You can brush a small amount of bacon drippings on top of the biscuits. Cover with a dis towel and place in a warm spot for 30 minutes. 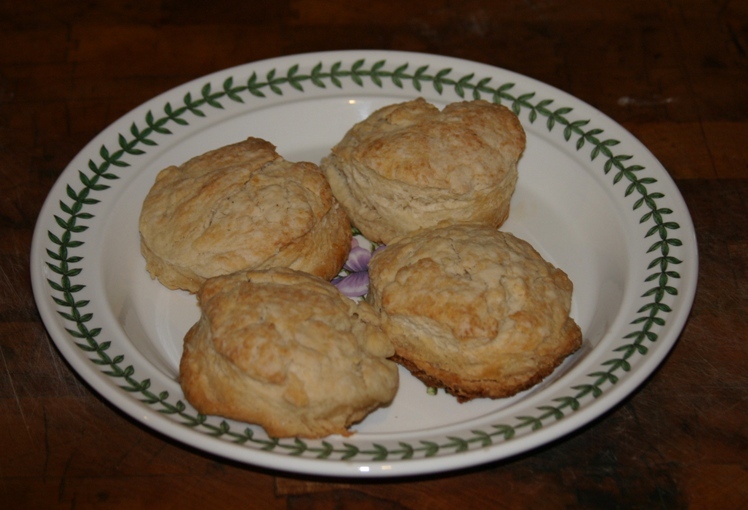 Bake for 17 to 20 minutes depending on your oven, until the biscuits are golden brown. Serve with butter and honey. This entry was posted in bread, breakfast and tagged sour dough. Bookmark the permalink.